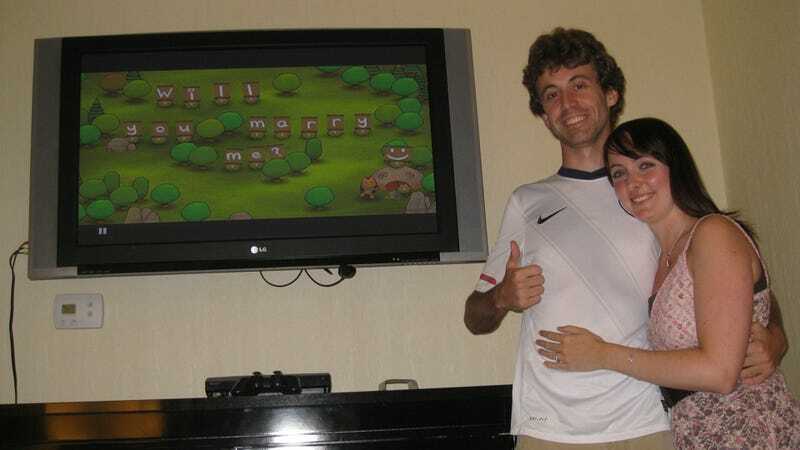 There have been gamers who've hacked games to ask their special someone to take the plunge, but how many game studios have decided to lend a hand in popping the question? Q-Games is the Kyoto-based studio behind a whole host of wonderful titles, such as the PixelJunk series. It doesn't only make video games, it also helps people get married. Gamer Russ and his ladyfriend Jaclyn love playing PixelJunk Monsters together. Russ wanted to ask Jaclyn to marry him, but he wanted it to be special. So he asked Q Games for help. Q-Games created a video of a mock PixelJunk Monsters level. "Russ installed this video on his PS3, he subtly suggested they should sit down for some Monsters couch co-op, and he pretended to boot up the game by 'playing along' with the video," Q-Games Assistant Producer Ariel Angelotti told Kotaku. "Jaclyn didn't have any idea it was a movie she was watching and not the normal PixelJunk Monsters game." Talk about going above and beyond! Jaclyn said yes, and now Russ and his new bride are headed towards co-op marriage bliss. Congrats to them. Q-Games even told Kotaku that it would be more than willing to send along this video to those who want to use it to propose to their squeeze. Remember getting married is like a video game, and Q-Games takes no responsibility for your inability to get to the next level.